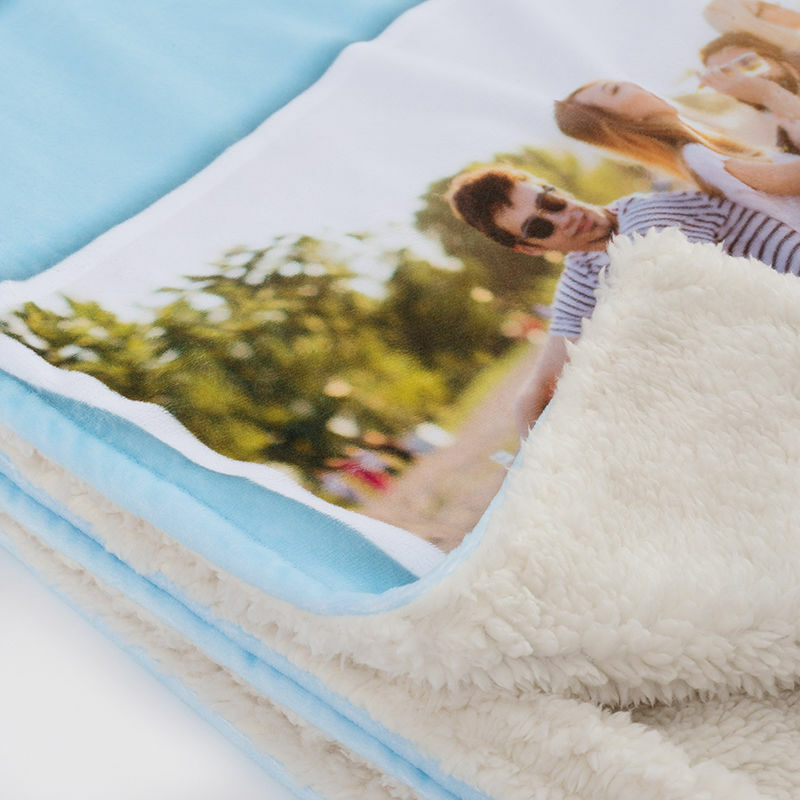 Cuddle up in style with your very own personalised faux fur blankets, made from 450 gsm plush velvet with a luxury 200 gsm Sherpa fleece backing. Show off your special photos or artwork on the front of the blanket, beautifully framed with the white unprinted edges, and choose from two gorgeous backing colours. Add a splash of luxury to any room with this dreamy blanket, the perfect way to add truly unique décor. 10-year guarantee. Made from gorgeous luxury velvet and fleece, there’s nothing cosier than snuggling up under a super soft faux fur blanket printed with your unique designs. Showcase your photos or designs on the front of the blanket, and choose a chic coloured backing with two different colour choices. Whether you’re after a warm blanket for cold winter nights, or simply want to add some stylish décor to a room, this custom piece is the perfect way to add something truly unique to your home. Have fun playing with photomontages in our online design studio, with the option to add text to add an extra personal touch. I ordered the large throw with black fleece backing and covered it in black and white photos with a grey background. This was a gift for my son's 18th, a memory blanket. It's wonderful quality, luxurious, and the print is very clear. It's very velvety and the service was very prompt. We all love it, please feel free to show a photo of it! The throw was far better quality than I was expecting, the pictures came out well and the fabric is lovely and soft. The experience of designing and ordering was extremely simple too. Amazing quality. Worth the money I have purchased 2 of these and the second one was 2 years later than the first. The quality is so much better, anybody debating whether to get one, go for it I was over the moon with the quality I wished that I had paid that bit more for the largest size of the luxury photo throw. I got 25 different photos on it and it really is beautiful. Will deffo be getting more of these as they are so lovely. This was my second throw i got it for my mum's birthday its amazing and the quality and photos are excellent..the ordering and delivery was excellent. Care: Machine wash at 30 degrees Celsius, do not tumble dry. These blankets are suitable for anyone! With complete creative freedom, you can design the perfect gift for a loved one, or a beautiful new home furnishing. Make a cosy blanket to keep your little ones warm at night, covered in images of their favourite storybook or cartoon characters to give them the sweetest of dreams. For a dramatic home style piece, experiment with colours which will beautifully contrast against the beige of black backing. Using a professional printing technique, we will expertly print your designs onto the plush velvet. Our sublimation dying method means the inks lock directly into the fibres of the fabric, resulting in a long-lasting print, which is vibrant and consistent. Your design won’t crack or peel over time or with washing and even comes with a 10-year guarantee. After adding your chosen backing colour of either beige or black, the blanket is then cut and sewn together by our skilled makers in our London factory. This versatile piece can be used as a cosy blanket, a sofa throw, or even as a rug, to create a statement in any room. Get creative with your designs and experiment using it in a number of new ways. If you plan to use your plush velvet blanket as a rug, try adorning the front with beautiful Indian-inspired designs. Bright colours and intricate patterns will pop against a plain carpet or wooden floor, creating the perfect centrepiece for any room. If you want to create a blanket as a loving gift, why not experiment with adding a photo collage featuring wonderful family photos? Using our online design tool, simply upload your happy memories and experiment with the creative frame options. They make the perfect gifts for birthdays or special occasions, so you can even add that special someone’s name to the front.